Update: This article refers to the old Eclipse based Android development environment. This article has been archived and is kept for historical purposes only. No AVD Sound When Testing an Android App? AudioTrack Error obtaining an audio buffer, giving up. AudioTrack obtainBuffer timed out (is the CPU pegged?). AudioFlinger could not create track, status: -12. Be aware that the last error is also seen with other sound playback issues. These other issues are usually memory related: such as the audio file is to big; too much data in the file (e.g. sample rate to high or varies to much); or the limit (32) on the number of audio tracks attempting to be played has been reached. Note: If you don't see messages in LogCat the following solutions may still apply. But also check that the PC's sound is not off! (Or turned down low). Even forgetting to unplug headphones may be why you have no AVD sound. Is the PC volume turned up and sound muting off? Are speakers plugged in? Or headphones in the headphone jack? Uncheck Launch from snapshot when starting the AVD. Edit the AVD config.ini file to set Audio playback support to yes. Delete the AVD and recreate it. Use a physical Android device. He is a bit more detail on each AVD solution for no AVD sound. (Please ensure that the Android SDK is up to date as well). Open Android Virtual Device Manager by clicking the icon on the Eclipse toolbar or using the option in the Window menu. Select the relevant AVD. Press the Start button. 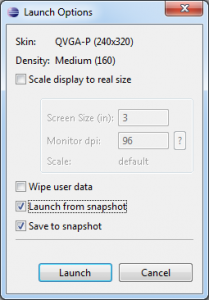 When the Launch Options dialog appears the Launch from snapshot option may be checked. Make sure that Launch from snapshot is unchecked. Press Launch. The AVD snapshot configured without audio playback will be deleted. (Anything else stored on the snapshot is also lost.) When the AVD is closed a new snapshot is created (if Save to snapshot is checked). If the Hardware section exists make sure an entry for Audio playback support is not set to No, change it if necessary. If no Hardware section is available open the configuration file for the AVD. Where is the AVD configuration file? On a Windows machine this is in the .android directory for the logged on user (normally under the Users folder). 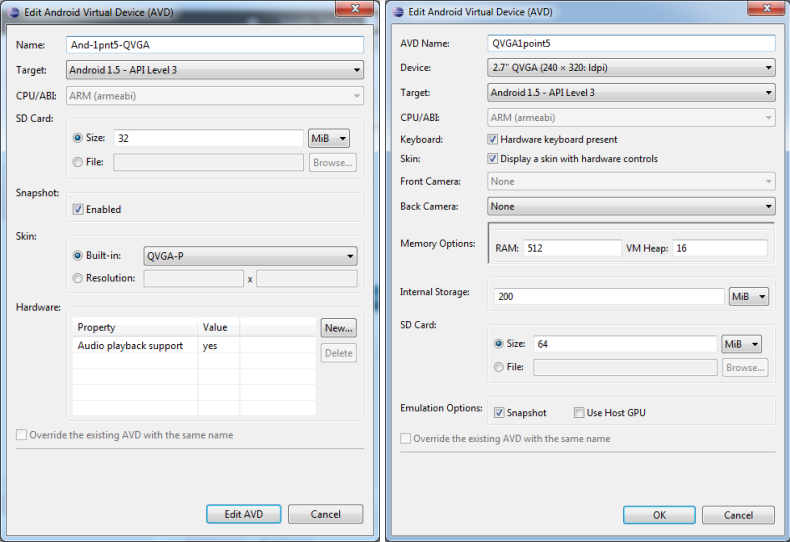 In this .android folder is a avd directory containing all the defined AVDs. Open the relevant .avd folder and edit the config.ini file. (The name of the AVD matches the folder name.) Add the setting hw.audioOutput=yes and save the config.ini file. Run the AVD again to ensure that the AVD sound is on. emulator: ERROR: Unable to load VM from snapshot. The snapshot has been saved for a different hardware configuration. Because the hardware configuration has changed any snapshot will be invalid. See the previous solution on running the AVD to clear an old snapshot. In the AVD Manager use the Delete button to remove the AVD that has no sound playback. Recreate it using the New button. See the previous solution if the new AVD does not have audio playback enabled by default. Hopefully one of the solutions above has solved the no AVD sound issue. If you cannot get audio playback working on an AVD you may need to use a physical Android device until the issue has been solved. Try a online forum, such as https://stackoverflow.com/, to search for or ask for suggestions to your specific problem.